Today's plant is Zanthoxylum americanum, Northern Prickly Ash or Toothache Tree. The name translates as yellow wood, although it doesn't impress me as being particularly yellow. 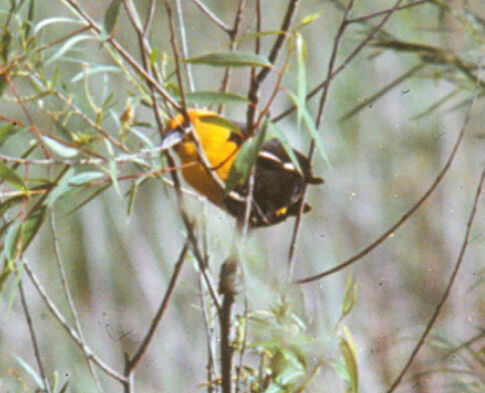 Yes, it's sometimes spelled with an X, like the Xanthocephalus, the yellow-headed blackbird. The "problem" is that the Greek letter for X is chi (pronounced KI, and the Greek letter for Z is zeta. In Greek the X doesn't make the ZEE sound, so the translation is done different ways. The plant is actually in the citrus family, but its fruit is a little berry, not much like a lemon or orange. Here are the blossoms. Notice the large thorns. 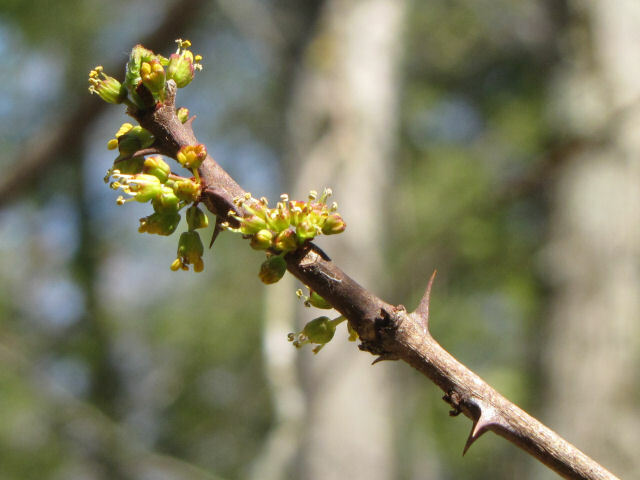 Believe me, you will know if you tangle with a prickly ash tree. The trees never get very large. These are about two inches in diameter. 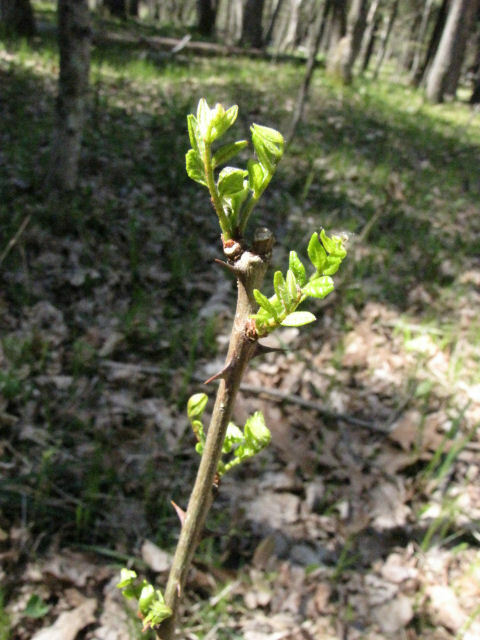 Although it is definitely prickly, it's not an ash. It's just that it has compound leaves, which look rather ash-like. The leaves aren't open yet, but here they are just unfurling. I'm really tickled to have found a grove of these, because they are a host plant for two butterflies, the Spicebush Swallowtail (a lovely dark butterfly with blue spots), and the Giant Swallowtail (a yellow and black butterfly- the largest one in the United States). I wish this stand was a little closer to where I live so I could check it out more often, but perhaps with my job I can stop by a bit more often. Toothache Tree comes from the fact that Native Americans chewed the bark or berries to numb their gums, hence relieve tooth pain. So, there we have the April Alphabet. Tomorrow... back to whatever tickles my fancy, although I've not strayed from my purpose this month. Sometimes I've moved things around by a day or two so they would fit. I'm beginning to catch up with my favorite bloggers. If you are new reader who plans to come back, WELCOME! I usually answer comments, and I'll start doing that again too. And, I did succeed in visiting all 1722 Challenge Blogs once. 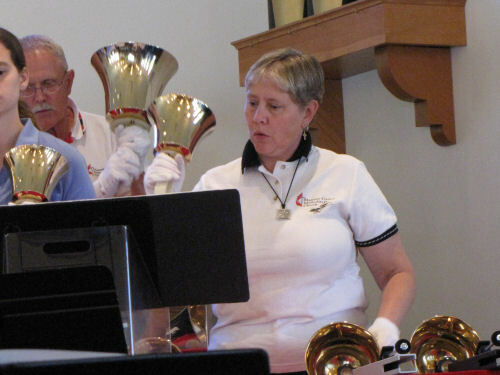 Remember my friends Loren and Dave who play in a handbell choir? 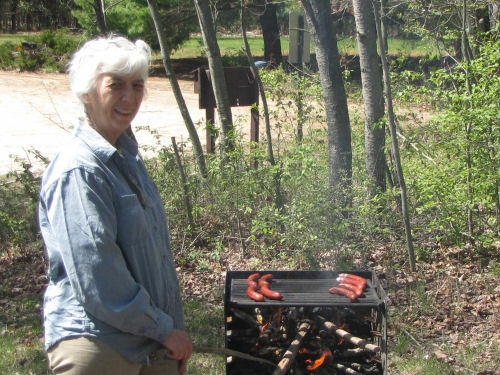 Today, their group plus three other groups joined together for the Manistee County Spring Ring. This hour-long program featured sacred and secular music, and even a story with sound effects. Dave got to do the biggest (deepest) bell. It's amazing how much variety of sounds bell choirs have to work with. They ring the bells, hammer the bells, use the hammers for percussion, and use chimes. The concert was more multi-dimensional than I expected. My favorite arrangements were "How Great Thou Art," and a ragtime version of "Rock-a My Soul." Each choir did a couple of pieces separately, and five songs were played by the combined group. I recorded the final song, which also featured cello, violin and flute. It's the familiar song: Dona Nobis Pacem (Grant Us Peace). Y is for Y? U Want 2 Know Y? Since I want to take one day to talk about the A-Z Challenge, I decided to make it work for today. There have been some positive things about this challenge, and others not so much. It was easy to blog every day and make it fit the alphabet. Since I blog every day, and things could be juggled a bit, that wasn't the challenge for me at all. However, I took on another personal challenge, and that was to visit all the blogs that were enrolled, and comment. When the month began, there were just over 1900 blogs. After a few days, the organizers had weeded out some of the sites that weren't blogs, etc, and the total ended up at 1722. A little easier, but still daunting. I still have 72 blogs to visit in the final two days, but I should make it. • Many of the bloggers did not turn off word verification, as was requested by the administrators. The corollaries to this are: The absolute worst are some Disqus blogs where you click for the comment box, wait for it to load, enter the comment, then another box opens for your personal info, then another box opens for word verification. • Some of the blogs entered don't accept comments... why join if you don't want to hear from readers? • I just couldn't visit all the new blogs, and all my regular favorites. Starting in May, I'll be trying to fix that. I've caught up with a couple of you, and I only hope I haven't lost some of you because of my neglect. Will I do it again? Probably not. Well, for better or worse, there is just one day to go! I think I have a really good Z! Here's a hint. It's really interesting that "Y is for yellow" comes between X and Z. About all I can say for this picture is that I took it myself, about four cameras ago. It was taken in northern Illinois in the summer of 1993. This is a yellow-headed blackbird, Xanthocephalus xanthocephalus. It's the only species in that genus! My bird guy says they occasionally pass through here, but they mostly hang out west of Lake Michigan. They are larger than the red-wing blackbird, and definitely louder! That summer was the most amazing of my life. Chips was a puppy and we were staying on a 300 acre wetland reserve doing research. You didn't expect anything else from me, did you? These are just a few beauties from the past week or so. 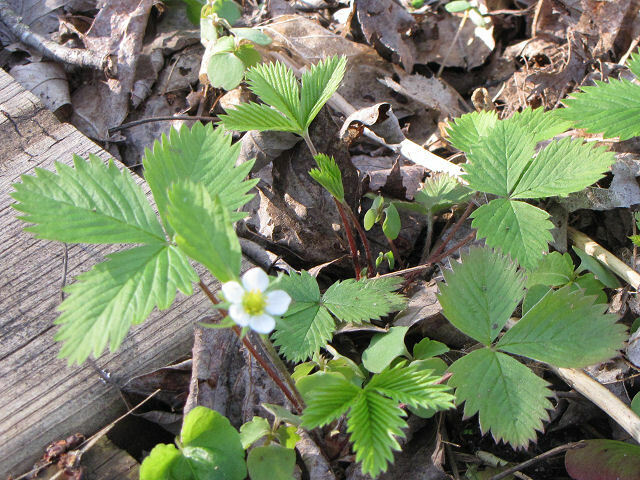 First, a common one, the wild strawberry, Fragaria virginiana. Do I need to say more about that? Next is one that isn't so often seen. 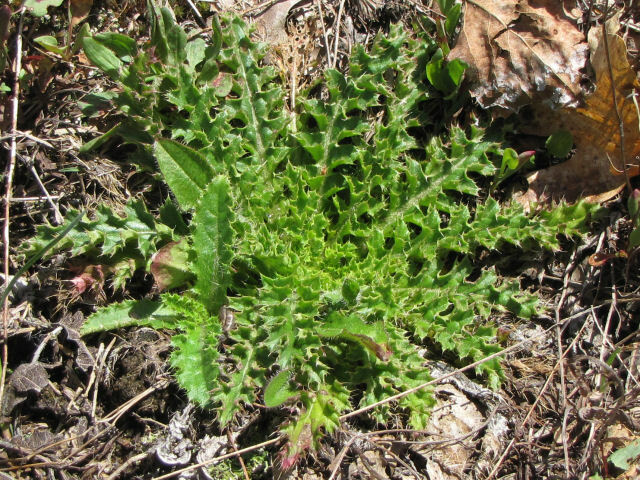 Some may recognize it as a cress, a member of the mustard family. However, look closely at the basal leaves. See how deeply lobed they are? 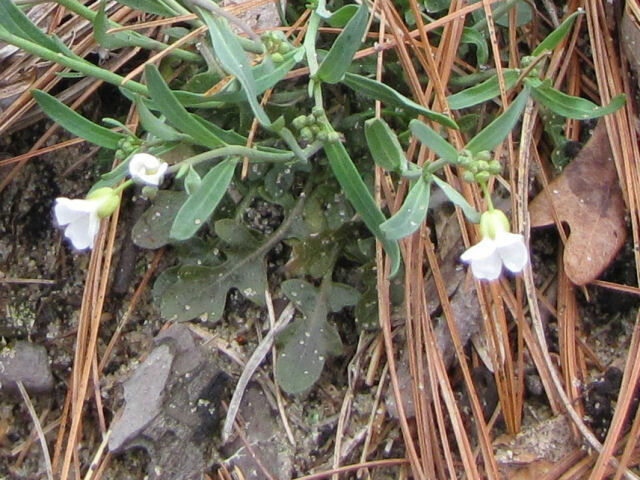 This is the lyre-leaved rock cress, Arabis lyrata. Ellen and I found it along the White River. Yes it's a cousin of the many Arabis which are used in rock gardens. Finally, here's another one that the Forest Service is working to restore to the Loda Lake Wildflower Sanctuary. It's a prairie plant, and they are restoring an oak savannah in the old barnyard area. 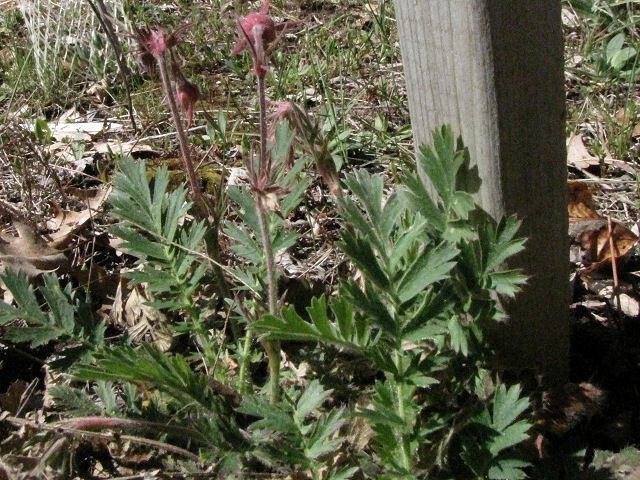 This is Geum Triflorum, prairie smoke. It gets its name because the seed pods are a feathery gray plume that looks smoke-ish. Almost done with this A-Z thing. It's worked out fine, but I have some goodies that haven't fit to show you when we are done. This is a treat, although it probably looks like a little brown bird. 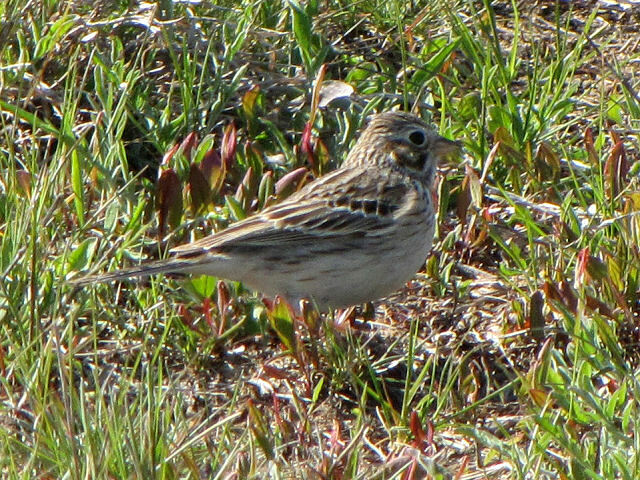 Yesterday, in my back yard, I snapped these pictures of Pooecetes gramineus, the Vesper Sparrow. (And how convenient that its name starts with V!) 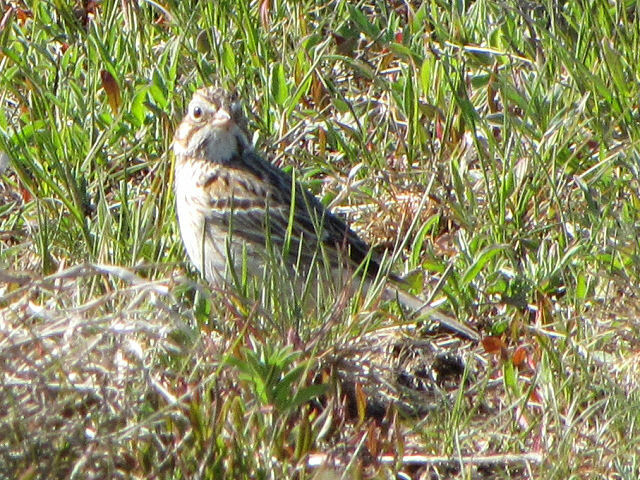 I keyed it out, and then checked with our local bird expert, and it really is a Vesper Sparrow, only an occasional visitor in our county. I first became acquainted with this bird in the Adirondacks of New York, on a hike. We never saw the birds, but were sung to sleep by them most nights. Their song is very sweet, and they sing in the evening-- hence the name. Notice the white eye ring, and brown cheek patch with white around it. Yup, it's that B-day thing, and I'm that old. Wow. My celebration was Saturday afternoon. 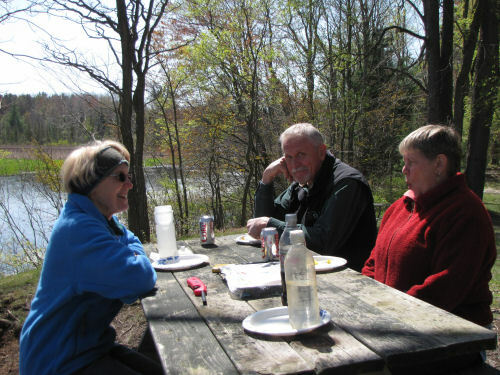 Ellen, Loren, Dave and I went to Gale's Pond. We had a little cookout. What did we cook? 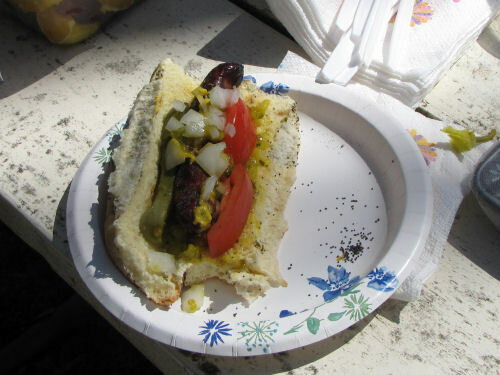 We had genuine "Chicago Style" Hot Dogs. Today, my goal was to just enjoy a leisurely pace. 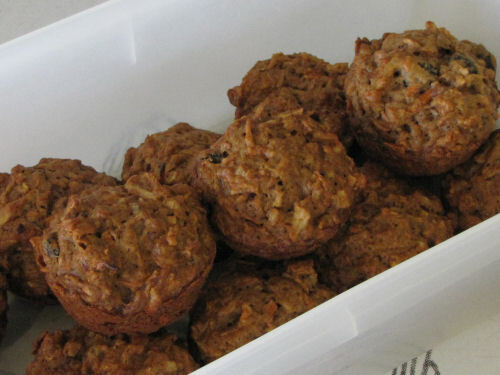 I mowed part of the lawn, and made Morning Glory muffins to take to my writers' group tonight. I read a bit, and did some of my normal computer stuff. Many, many people sent me greetings on Facebook. I'm pretty amazed at that. Occasionally, I've brought you pictures from a play I attended. I went to this one Thursday evening, but saved it for "T" day. I'm going to try to do a fair critique of this. The name of the play is Crime on Goat Island, by Ugo Betti. This play isn't performed in the United States very often. In fact I'd never heard of it before, let alone seen it, but it was written in 1946. There were some good things about this production, and some not-so-good things. But first, the plot. 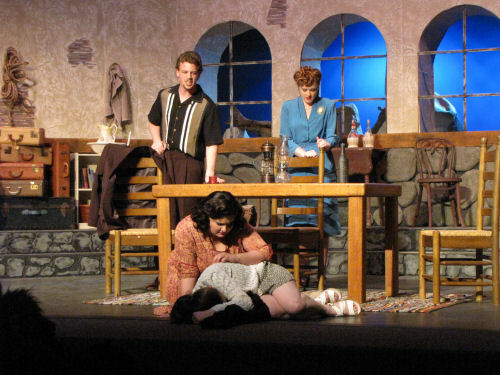 The play is set post WWII on Goat Island, off the coast of Italy. There are four main characters. Three women live in the house on Goat Island. Agata is the widow of a soldier and Pia is the sister of that man. Silvia is Agata's daughter. At the beginning of the play, a man, Edoardo, comes to their house. He claims to have known Agata's husband, and to have been with him when he died. To cut to the plot, within hours, Edoardo has begun to seduce the three women, and over the course of the next two months becomes the lover of all of them. What should the women do? In this scene, Edoardo has just arrived, and Pia and Silvia find him quite enchanting. Agata is not so sure. 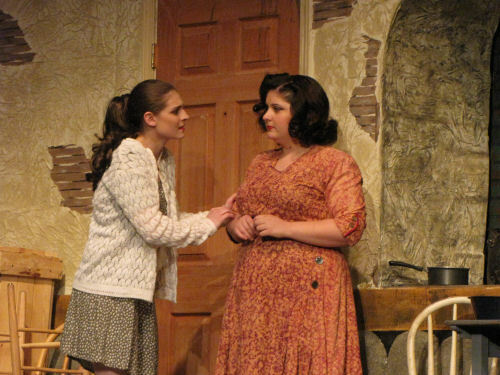 Near the middle of the play, Silvia implores her mother to send Edoardo away because he is tearing them apart. In Act 2, things are going downhill. The women are aware of each other's involvement with Edoardo, but they are torn about what they should do, or want to do. I read online that the play has themes of good and evil, and redemption. This production was done by the local community college. As a learning experience for theater students, this was probably an excellent choice for a play. However, for public consumption, they needed to do some additional education. There was no synopsis of the play in the program. The publicity didn't really make it clear that it was a serious play, and not suitable for children. Whenever I go to a play I'm not familiar with I always have to decide if I'm going to read the play first, or at least a synopsis, or just attend "cold." I decided to not study this play in advance, and it was the wrong choice. For one thing, the director decided to have the actors speak with an Italian accent. It was very difficult to understand some of the dialog, and I know I missed some important lines. 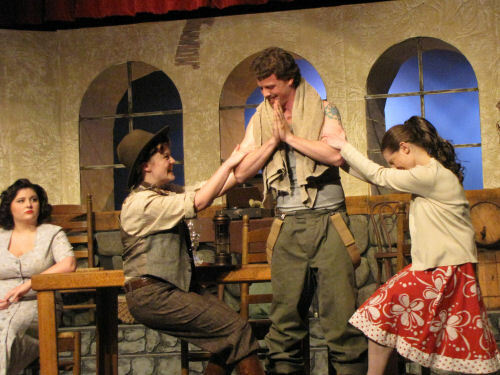 For sure, if I want to have any idea what this play is trying to say about redemption, I'll need to read it. The island itself was supposed to be a symbol of the struggle. The goats were necessary for the economy, but they ate all the vegetation and removed all the beauty. Twice, real goats were brought on stage. Because the audience didn't understand that the play was a serious drama, the live goats were only a distraction as people did the "oh they are so cute" thing. I'm glad I went. I became acquainted with a different play. The set was good, the costumes were excellent. The acting was believable-- all young people (one minor role was played by an older adult), and two of them had to portray older characters. That's saying something because the first act has a lot of long, interminable speeches by Edoardo. In short, it's probably a difficult play for American audiences to appreciate. Since we get Sundays off from the A-Z Challenge, I'll bring you some special plants from Loda Lake. I think I'm holding out some more for "W" day, too. There is a natural diversity of plants at Loda Lake, and the Forest Service is working hard to restore some plants that were recorded in the area in historic records. 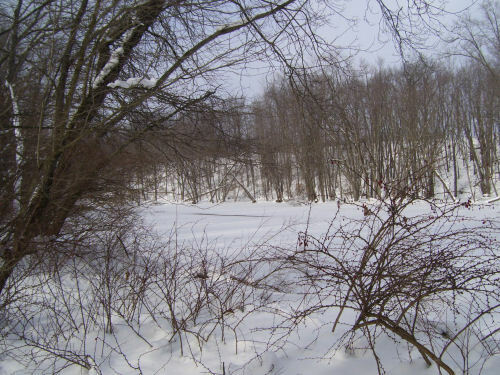 The area was clear-cut around 1900-- most of Michigan was. Then homesteaders came and tried to farm, but the soil was too poor. Most of the farms failed. The land was bought by the relatively new U.S. Forest Service. Think of a forest with no trees! It was all very different from what we have now. 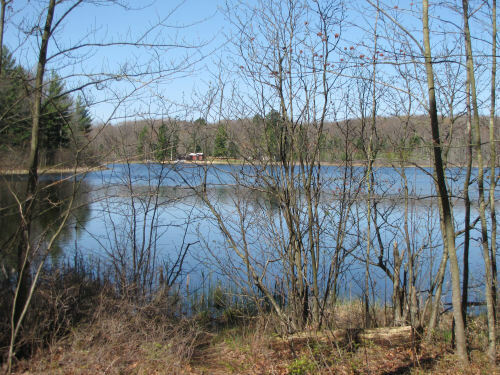 Loda Lake was acquired in 1939. There are remnants of a large estate and two smaller tenant farms. All the buildings have been removed, but the foundations remain. Around the two small farms, oak savannah is being restored, including prairie plants. So, our first little treat is Hill's Thistle, Cirsium hillii. This plant is completely new to me, but with the distinctive basal rosette, I might remember it. Of course, late in the summer it will have purple tufts of blooms. It is a rare species, requiring open sandy soil. Next, here's a new fern. I didn't put this one on my photo pages, because I'm taking the botanist's word for it that it is Goldie's Wood Fern, Dryopteris goldiana. To be honest, it doesn't have some of the features noted in the field guide, so I'm just not certain. But, it's a pretty little thing. Finally, the hit of the day (with me, anyway). 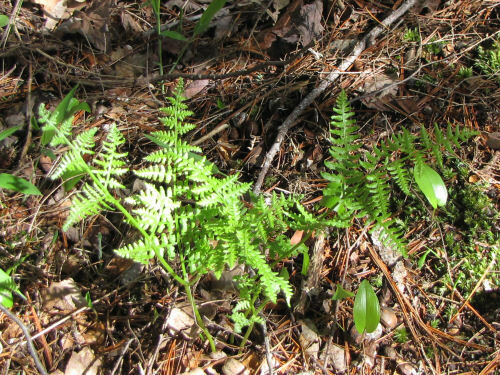 There is a genus of ferns called moonworts. I've showed you one of them before. 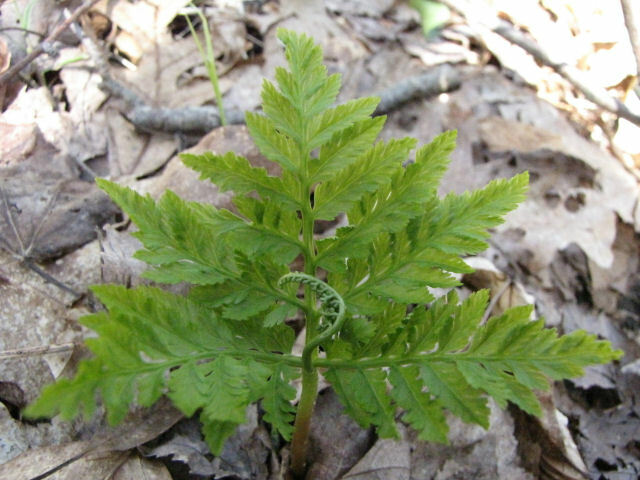 None of them is common, but the most often seen is Grape Fern, because it does get larger than the rest. I've only seen them a couple of other times. Yesterday, we must have seen two dozen! All were just beginning to unfurl. That "tongue" in the middle is the fertile frond, the one that bears spores. I do have pictures of this fern when it's mature, but I'll have to hunt them up and show you another day! See Moonwort, But Which One? 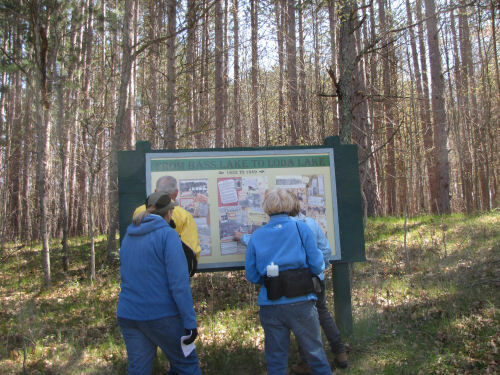 Today was the monthly hike for the Spirit of the Woods Chapter of the North Country Trail Association. After the hike, some of us went on to Gale's Pond for a while, and then I had a meeting tonight. I'm too tired to do this post justice, because we saw a number of rare plants. I'm going to beg off for now, and hopefully bring you some of those in the future. The hike was at Loda Lake Wildflower Preserve. It's about an hour from where I live. It's the only Forest Service Wildflower Preserve there is! It turned out to be too early to see a lot of things in bloom, but I learned a lot, and saw some plants I didn't know very well. A Forest Service botanist met us there and gave us a guided tour. That tour also included some history of how the area came to belong to the forest, and past land use, which included two small farms. Here are some members of our group inspecting a display about that history. I probably drove everyone crazy jumping around and ooohing and aaahing about plants, but hey.... it was a wildflower hike! I promise you pictures in the future, but I want to be able to tell you about the plants, and I'm falling asleep! 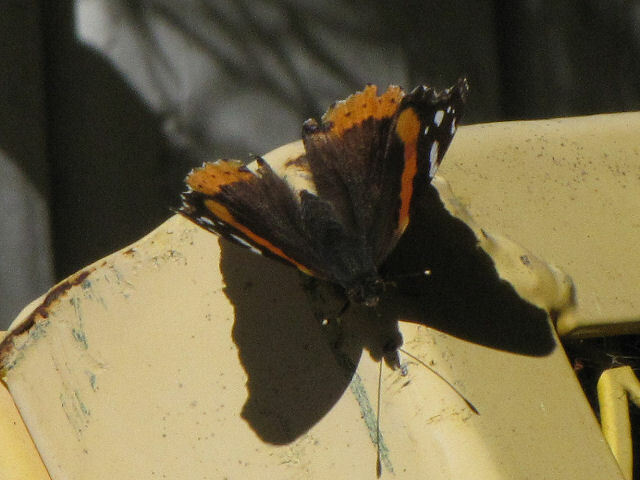 Today, it rained all day, which would also be a great R, but there has been an explosion of Red Admiral butterflies this week, which seems more interesting. Seriously, when I walked out back, every few steps another one of these butterflies would rise from the grass and flutter past. Yesterday was sunny, and while I was out doing assignments I managed to catch a photo of one basking on a warm railing. Earlier in the week I literally caught one, and took one picture. 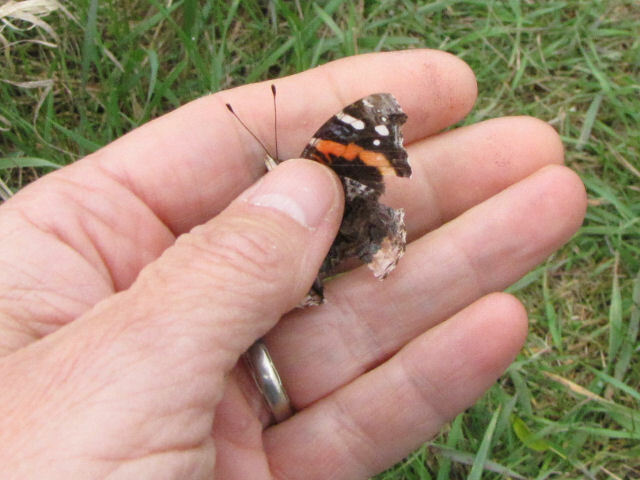 I was hopeful that when I let go it might sit still for a minute, allowing me to get a close up, but no such luck. All you get is a picture of the captured butterfly. It has a pretty scientific name, Vanessa atalanta. Tomorrow is a busy day. Come back and find out why! This is called having a button and pinning a vest on it. Sort of. As is turns out, one of the key pieces of this post is in a baggie somewhere in my office and I can't find it to show you a picture. Yes, I have a bag of porcupine quills. "Why?" you ask. Simple. 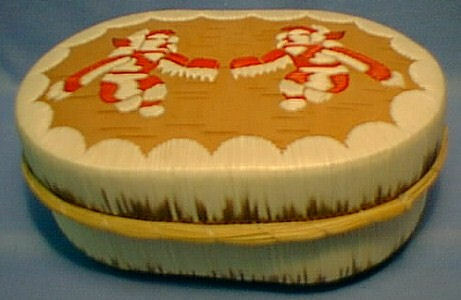 I want to try some Ottawa quillwork. 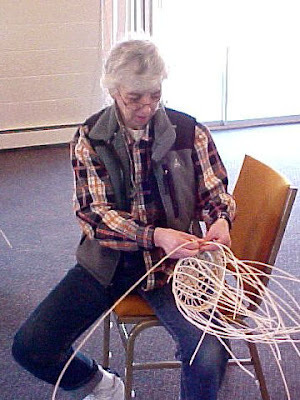 This is not the same thing as quilling, which is a curled paper craft that my buddy Ann likes to do. 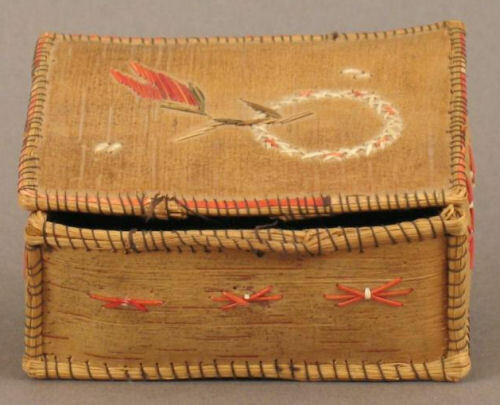 In January, I read a book called Ottawa Quillwork on Birchbark put out by the Harbor Springs Historical Society a number of years ago. 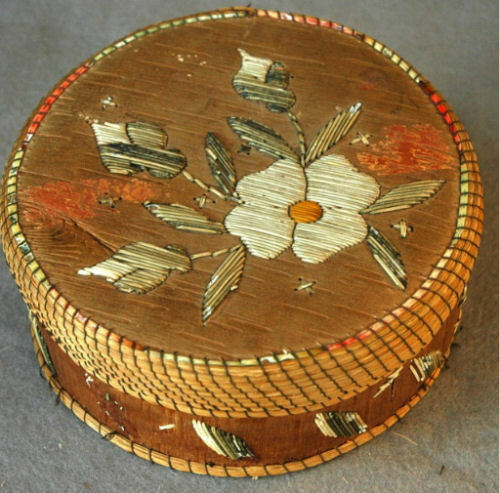 It was in a friend's private library, and it had pictures of significant quillwork boxes from their collection. It also included instructions on how to do the several techniques. I found a few pictures of the kind of thing I'm talking about. NOTE: I DID NOT MAKE ANY OF THESE. I just would like to. The pictures are arranged from simplest technique to more difficult. Those of you from other places in the world than the USA may be wondering what quills are. 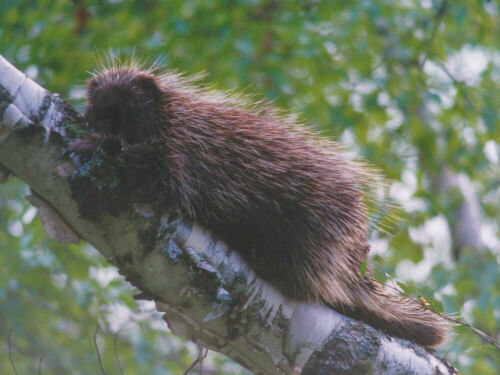 They come from this creature, the porcupine. Each quill has a small barb at the end. If you have a dog that tried to get too friendly or too aggressive with a porcupine, you know what happens next. The barbs stick in skin like a fishhook, and must be removed with pliers. However, except for the barb, which you can cut off to craft with, the quills are somewhat like a softer version of a feather shaft. That's kind of what they feel like. Anyway... some day, I hope to at least try a small project using some of these techniques. 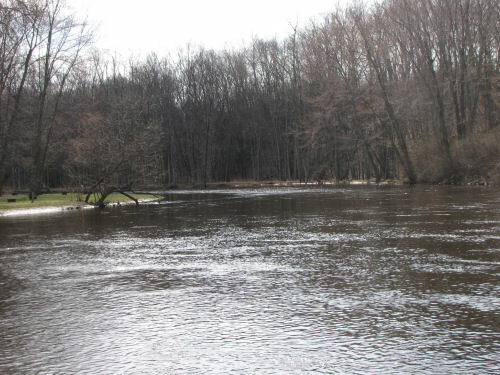 If you are a regular reader, you have seen quite a few pictures of the Pere Marquette River. It's one of several rivers near where I live, but it's the one closest to me, and I often walk near it. But I thought you might like to see how it fits into the state. Yes, it's a little confusing with the Middle Branch and Big and Little South Branches. Don't worry about it. 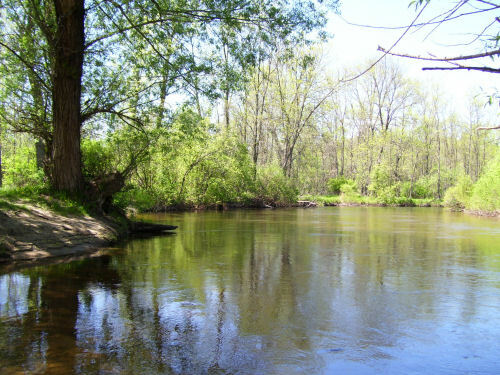 Along the main branch, the dark blue, from the east end of the dark blue (Where the Middle Branch and Little South Branch join) west to Scottville, the waterway is a National Wild and Scenic River. This means it has "outstandingly remarkable scenic, recreational, geologic, fish and wildlife, historic, cultural, or other similar values." There are some protections this designation brings. I decided to show you a picture of the Pere Marquette from each season of the year, beginning with spring. I took this picture a couple of weeks ago at Scottville Riverside Park. Here is a lovely view of the river near Walhalla, taken in 2007. Fishing is popular in most seasons. Trout and steelhead are the most popular fish. 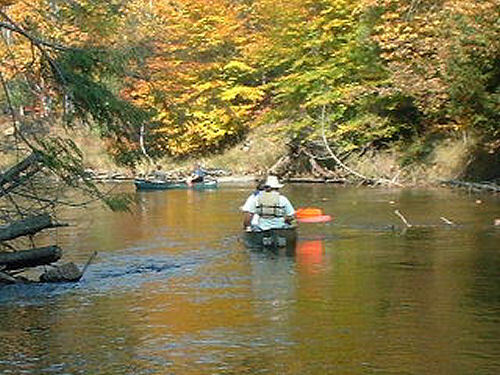 For fall, we'll go to the Big South Branch and do some canoeing. It's a great river for canoes and kayaks- lazy enough to be safe for family trips, but enough current that it's not a complete bore. As you can tell, the scenery is great. Most winters, the river becomes hushed and magical. For this shot, we are back to Scottville Riverside Park. 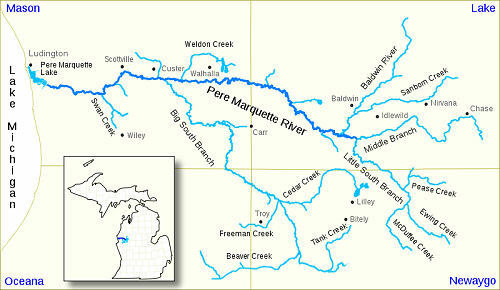 The river is named for Jacques Marquette a Jesuit priest, who founded Sault Ste. 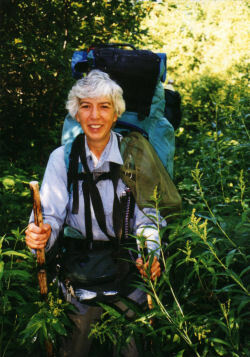 Marie and St. Ignace, Michigan, explored Lake Michigan, and with Louis Joliet were the first Europeans to explore and map the upper Mississippi River. Hope this has provided a little more perspective. I added links to some previous posts about the river. You didn't think I'd get all the way through the alphabet without something crafty, did you? I'm showing you a project from 2002. 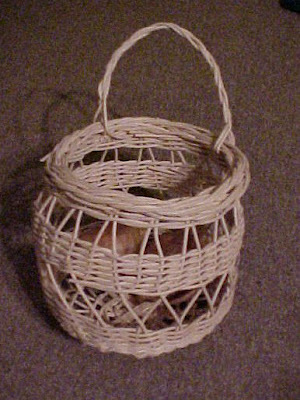 It's an onion basket I made in a class. I've enjoyed making baskets since my first simple one in Girl Scouts. I'd like to make some that I collect the materials for myself, but there are just TOO many things I'd like to do. So, this one isn't very "natural," but I use it all the time to store onions. It's very practical. The reason it's on my mind is that on this A-Z Challenge, I visited Petra, who made a potato net! Now, there's a simple little project that I really need. You can see it at This Good Steward. You have to scroll down (or read her poem on the way). I commented about the basket, and she said she'd like to see it (I AM reading all the comments, even if I'm not responding). So...at Petra's command (and because it's a nice "0") you got the onion basket.